The good news the entire rebuild is going well. Drive line all complete, rebuilt engine running and sounding good, brakes all new and up to pressure, Electrics at 90% - total rewiring. Great feeling to see the little roundie lights come to life this week. However, I'm having trouble getting the headlights to activate from the switch. The headlights work, as I can take the red power wire and connect it to yellow or white on the dip switch and all is good. The switch activates the park lights (right and left) no problem, and earth is good on the front of the car. When I use a probe to check the switch is supplying power, it only supplies power to 58L and 58R - at both stages. I don't get a power read for any of the other other connections when switching - so you'd naturally assume the switch is No Good. However I've tried 3 switches. The one in the picture I sacrificed and pulled it apart to see if it had a problem. No power to yellow/white (headlight) or Grey - (Dash and LP light) via fuse box (6 fuse by the way). 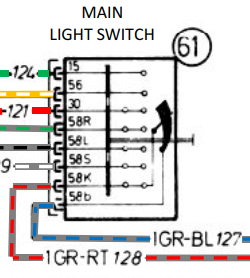 I think I've got the wiring correct according to the wiring diagram, however it has different numbers on the switch. Surely 3 switches cant be stuffed, they all look ok.
Also, FYI the high beam 'flash' works when park lights are on. Does the switch need a seperate earth somehow? Have I a had a massive brain fade somehow? All lights only work when ignition is on. FYI - Once I get it all working, i'll be either setting up relays for the lights - and fuses. Does your car have wires that connect directly to the two column stalks - or does the stalk wire to a plastic connector under the dash? I'm betting it is the former type like my 69. I can add some details later this morning. And the usual plug here, if you haven't yet, please read my tech article on lights wiring and do make sure to put in proper relays! @jgerock yes, its not the connector type, quite early model. The high beam stalk drawing you did is the same wiring as mine. 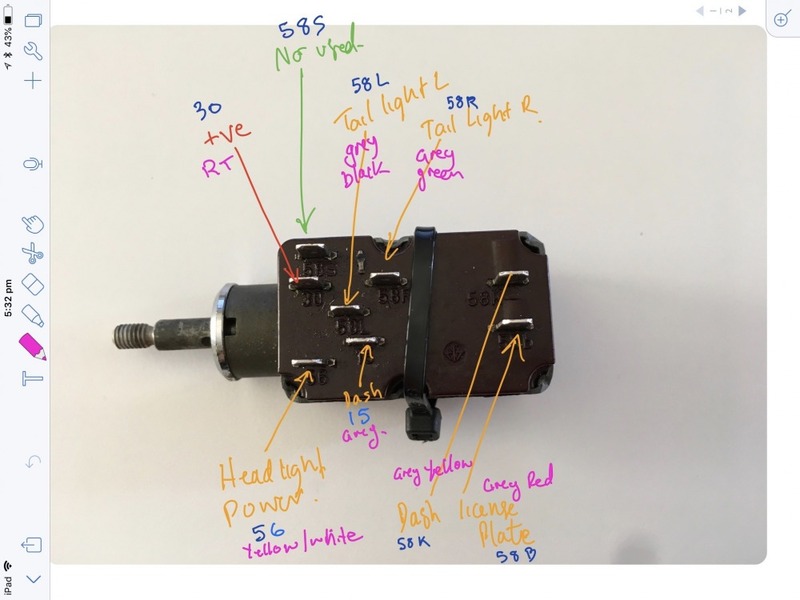 @AustrianVespaGuy Thanks, that makes sense - now I just need to work out if the grey wire runs off a double spade connector to power dash lights and license plate light. I could see when I put the multimeter across 15 and 56 it switched, but totally contradicted the wiring diagram for a 70 '02. Perhaps as mine was a really early 02 for Australia RHD, they had to do something different. Right, the 4 switch positions (I, II, III, and IV on the diagram) are park, accessory, run, and start. The two #15 terminals get +12V only in the 'run' and 'start' positions, and have the solid (un-fused, fused wires are the striped ones!) green wires coming from them, one of which goes to the matching terminal 15 on the light switch to provide the power to the low beams when the car is 'on.' Again, this is how it works on later models, but since you clearly have the same switch, it can certainly work the same way. I'll reiterate though this is slightly academic, as what you really SHOULD do is put in proper low and high beam relays, instead of running all of the lighting current through the ignition and light switches. But I guess you still need to get it basically 'working' first, and then it'll be easier to make that next step. Edit: is your grey wire perhaps actually a grey wire with a white stripe? If so, then it can either go to terminal 58S or 58K to provide the power for the dash lights, but which of these two is 'correct' will depend on what wire goes to the license plate lights, a grey/white or grey/red one. . . Thank you very much for that explanation, I can definitely now see what you are saying, i'll get onto it. Yes I will definitely be setting up the relay system / fused system. As you say, I'm checking all functionality first then will do that. I was just going to add. Check out the wiring diagrams on the tii registry site. It looks like you are using the diagrams in the Haynes manual which may not work exactly. I highly recommend adding relays and fuses for the high and low beam circuits. These early 6 fuse cars were woefully inadequate as far as the electrical circuits. Oddly enough, my 69 has a ground screw located behind the gauge cluster (at the metal portion of the dash) but my 73 does not. Looks like the harness was changed so the left heater box mounting stud is the new grounding location.